Joe O’Byrne is best known for ‘Tales from Paradise Heights’, a series of plays set in a present day, tough, inner city estate, so there was some intrigue not to say surprise when news broke he had a written a ghost story, set in the 1950’s within the realm of a country house. 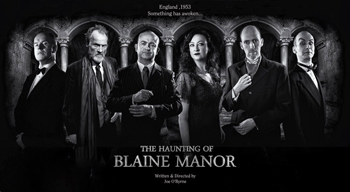 The Haunting of Blaine Manor harks back to the age of classic suspense and horror films and film noir, with memorable characterisations such as a creepy Peter Lorre, sinister Vincent Price or sultry Lauren Bacall. The main characters in this play provide a similar array of different personalities, introducing themselves to each other with all the Anglo-European customs and decorum of the period, apart from the American who is the perfect outsider, refusing to be bound by the traditional dictates of class and formalities. Jo Haydock as Vivian is the quintessential English lady of leisure, moving with style and panache, whilst in complete contrast, Dan Thackeray presents the stiff-necked and demure rigidity of the legal profession at that time. There are hints of Robert Mitchum in Roy, played by Peter Slater; the hard-boiled, no nonsense Yank, juxtaposed to the flowery English eccentricity of Scarabus, played delightfully by Phil Dennison. For me, the most entertaining and certainly amusing character was Cairo, played with superb camp fussiness by Andrew Yates. I thought Cairo could have been used to greater effect in the play but he certainly has his moments, as do all the characters, and credit must be given to the deferential butler Grady, eloquently played by writer Joe O’Byrne. The setting was quite superb, boasting a fine collection of period furniture, complete with 1940’s style radios and large globe doubling as a spirit depository. With such a sedate setting it was perhaps inevitable the play would start at a slow pace, and it does take some time to really get going, but by the interval an intriguing stall has been set up with very different characters presenting an interesting range of possibilities. The cynical, confident American progressively asks serious questions of the surroundings, his fellow guests and above all himself. It has to be said the first half in particular does not have the feel of a horror story, but there is great compensation in that it comes across very much in the same cannon as Agatha Christie or perhaps even Daphne Du Maurier. The second act is where the play really comes alive and the twists are skillfully woven, which few, if any, will see coming. Overall, the play can be described as a psychological drama and the actual reality of supernatural elements at work in the story remains open until well into the story. It is hard to say too much about the second half of the play without giving away spoilers but it is genuinely scary, with tremendous atmosphere developed, a world away from plays such as The Woman in Black which promise much but actually deliver very little in terms of real shocks. Overall, despite the slow build-up The Haunting of Blaine Manor is a compelling play, with genuinely surprising and shocking twists which keep you guessing right until the end. I would not put this play in the traditional haunted house mode; it doesn’t quite have the feel of an Edgar Allen Poe or a Hammer Horror. As a psychological thriller however, which Alfred Hitchcock or Roman Polanski might have directed in film format, it works very well and if you like dark, psychological dramas with a potentially paranormal dimension, this is a must see.